We use a multi-faceted affiliate recruiting approach to grow the affiliate programs we manage for clients. There are a few distinct strategies that allow our agency to recruit new, targeted affiliates at a faster rate than any other affiliate agency is able to. Experience Advertising, Inc., a leading affiliate program management and affiliate recruitment agency, has been named the #1 ranked affiliate marketing company for August 2018 on the TopSEOs.com list of the best affiliate marketing companies in the affiliate marketing industry. TopSEOs.com uses several objective criteria when evaluating the top affiliate agencies in the affiliate marketing and digital marketing arenas. Experience Advertising, Inc., founded by renowned e-commerce veteran Evan Weber, has been refining their ability to both recruit new affiliates and web publishers, as well as increase production with current affiliates and referral partners for the past 11+ years. Prior to launching Experience Advertising, Mr. Weber was the Director of Marketing for a very successful B-to-C dental plan portal where he orchestrated all of their Internet marketing and affiliate program growth. Since launching Experience Advertising in 2007, Weber has put the focus on helping affiliate marketers become more effective online marketers so they can increase their commissions. Weber stated, "I put everything I have learned, and continue to learn in my 20+ year career in digital marketing, into the helpful content I compose for our affiliate marketers. Our mission is to help every affiliate marketer, regardless of size or experience, to become more effective and adept at online marketing and social media marketing. Every day, I have phone calls with affiliate marketers, publishers, and bloggers of all types, about how to improve their websites, drive more traffic, and better monetize their online projects. I do this free of charge to the affiliates and web publishers in the affiliate program we manage. This is a major differentiating factor between our agency and other agencies in the space. Each affiliate is being personally mentored and coached by myself, if they choose to be." Experience Advertising provides affiliate recruiting campaigns for their clients, as well as completely managing the entire affiliate program to grow the company's affiliate channel to its fullest potential. About Experience Advertising, Inc.: Experience Advertising was founded in 2007 to help companies grow and manage their affiliate marketing programs on affiliate networks like CJ, Linkshare, Shareasale, and in-house programs. They transformed into a full-service digital marketing agency to help e-commerce companies manage all of their online advertising platforms more effectively. Weber continued, "I decided to make the transition because our clients needed additional digital agency services that we are able to deliver more effectively than they can handle internally or through other agencies. I utilize my e-commerce background and my experience working with more than 300 e-commerce merchants into managing effective, ROI-focused online marketing and social media campaigns for our clients." Weber states that he is able to implement several website-based strategies to boost the overall conversion rate of the merchant's website, so all of their traffic will convert at a better rate, which has a tremendously positive impact on their affiliate marketing channel. Weber stated, "When the advertiser's website converts traffic at a higher rate their affiliates can really prosper and grow like they should. Few companies place enough emphasis on boosting their website's conversion rate and therefore aren't able to grow their affiliate marketing channel like they would like to. When you have a well converting website, combined with motivating promotions, your affiliates will produce more sales and therefore put more effort into promoting the company which increases traffic and sales in the affiliate program." Experience Advertising has an affiliate recruiting service that has become very popular with clients according to Mr. Weber. Weber stated, "We use a multi-faceted affiliate recruiting approach to grow the affiliate programs we manage for clients. There are a few distinct strategies that allow our agency to recruit new, targeted affiliates at a faster rate than any other affiliate agency is able to. We are able to identify, through a proprietary tool we developed, 100's or even 1000's of relevant affiliate marketers to our clients' niche or industry, and then send them personalized prospecting/invitation emails to join our client's affiliate program. We also use the recruiting tools provides to our agency through the major affiliate networks to send 1000's of targeted 'offers' to prospective affiliates for our clients. These two affiliate recruitment strategies allow our agency to add thousands of targeted, relevant affiliates and web publishers to our clients' affiliate programs. Over time, we are able to typically grow large, productive affiliate programs for our clients with 1000's of active affiliates participating in marketing the company online. This type of affiliate recruiting strategy, combined with the superb affiliate messaging we send, leads to a robust, highly productive affiliate marketing channel for our clients." Experience Advertising is a highly regarded affiliate program management agency OPM with 10's of 1,000's of satisfied affiliate marketers under their direct management. If you are looking for an outsourced affiliate program management agency (OPM) or a digital marketing agency to handle your e-commerce marketing channels, contact Experience Advertising today for a complimentary site evaluation and customized proposal. Experience Advertising has a phenomenal reputation in the affiliate marketing industry, having grown the affiliate programs of 100's of companies. 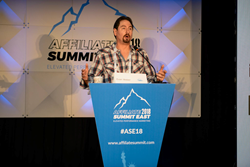 Evan Weber is one of the top-rated speakers at the annual Affiliate Summit East and West conferences.